How do I FTP with FileZilla? 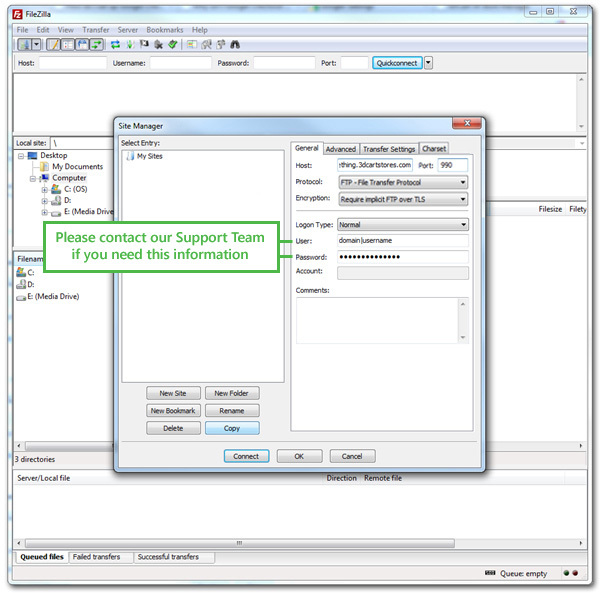 If you are using FileZilla as your FTP client, these instructions will help you connect it to your 3dcart store's FTP service. Open up FileZilla and click on the "Site Manager" icon located at the top left hand corner. Click on New Site to create a new profile to connect to. Typically this will be listed as "[your-domain]|[username]". If you do not have this information, please contact support and they will be able to supply you with it. You may also get this information from support. Before contacting support, please be aware that you will need to be verified as an authorized user on the account before FTP credentials may be given to you. If you are unable to connect, please contact our support team so we may help you and go over your settings with you.